April 02, 2019: The UBSE usually conducts the UBSE Class 10 (High-school) Exam in the month of March. The UBSE Class 10 Exams begin on the 2nd of March, 2019 and continue up to the 25th of March, 2019. Last year, a total of 149486 students took the Class 10th examination. It has been predicted that the number of examinees is going to increase this year. Students awaiting their Uttarakhand 10th Result 2019 should keep visiting this page come result time. This year the UK Board 10th Result 2019 is expected to be announced in the month of May, 2019. Students awaiting UK Board Result 2019 are advised to keep visiting this page for regular updates. The UBSE usually conducts the UBSE Class 12 (Intermediate) Exam in the month of March. The UBSE Class 12 Exams begin on the 1st of March, 2019 and continue up to the 26th of March, 2019. Last year, a total of 132381 students had taken the Class 12th examination. It has been predicted that the number of examinees is going to increase this year. Students awaiting their UK Board 12th Result 2019 should keep visiting this page come result time. This year the UK Board 12th Result 2019 is expected to be announced in the month of May, 2019. Students awaiting their UK Board 12th result 2019 are advised to keep visiting this page for regular updates. Type the desired state name, in this case - Uttarakhand. Look for the link which says Uttarakhand 10th Result 2019 / UK Board 12th Result 2019. 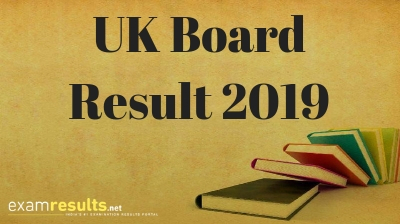 Click on the link and fill up all the details to get your UK Board Result 2019. The UBSE usually announces the results for UK 10th Result 2019 & UK Board 12th Result 2019 in the month of May. In 2018, the Uttarakhand 10th Result 2017 as well as the result for UK Board 12th Result 2017 was announced on 26 May, 2018. 2.8 lakhs students sat for the Class 10th & Class 12th exams held by the Uttarakhand board in 2018. In the year 2018, the overall pass percentage of students who appeared for the Class 10th exam was 74.57 % and for the Class 12th exam was 78.97%. In the table below, you can check the pass percentage for the past two years for both, UBSE 10th exam and UBSE 12th exam. We will update this table with the pass percentage for 2019 once the results for this academic year are out. Where To Check UK Board Result 2019?